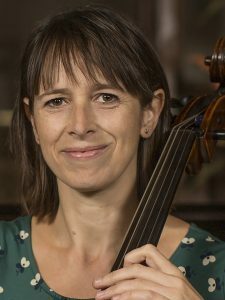 Kate Gould is the cellist of the London Bridge Trio for which she founded the flourishing Winchester Chamber Music Festival in her hometown in 2008. The festival celebrated its tenth anniversary by commissioning a piano trio by Colin Matthews, premiered at the 2018 festival. This season the LBT are recording trios by Clara and Robert Schumann and Fanny and Felix Mendelssohn, some of which were recently broadcast on BBC Radio 3 from a concert at St Georges, Bristol. Kate also established the Ironstone Chamber Music Festival in 2013 with her violinist sister Lucy Gould. She is a regular guest at the Festival de los Siete Lagos in north Patagonia, Argentina and the Peasmarsh, Corbridge, Wye Valley and Penarth Pier Chamber Music Festivals. This season she also appears at the Aldeburgh Festival and Sacconi Folkestone Festival. As a member of the Leopold String Trio from 1991 to 2008, Kate received awards from the Royal Philharmonic Society and Borletti-Buitoni Trust and took part in the ECHO Rising Stars and BBC New Generations Artists concert series. They recorded for Hyperion Records and collaborated regularly with pianists such as Paul Lewis and Marc-André Hamelin. Kate is also active in the orchestral world as a member of the Chamber Orchestra of Europe and frequent guest principal cellist of the UK symphony and chamber orchestras. She loves to teach and recently joined the staff at the Royal Welsh College of Music and Drama. Kate plays a cello by Carlo Guiseppe Testori of Milan, 1711, the purchase of which was made possible by the Stradivari Trust. 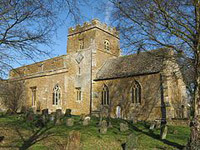 The church dedicated to St Etheldreda is situated on a hiilltop overlooking the village of Horley in Oxfordshire. It is Grade 1 Listed. An excellent example of a medieval church. Dating from Norman to 13C/14C - an ideal venue for the Festival. Copyright © 2019 Ironstone Chamber Music Festival. Powered by WordPress. Theme: Spacious by ThemeGrill.